I picked up the Oregon randonneur bike this morning. Satisfied customer photo should soon be on Bob's Flickr. It rides beautifully -- rock solid and steady, very stable. How fast and comfortable is it? Too soon to tell. I only rode it a few blocks, had Bob adjust the seat to the proper height, and rode a bit more, before loading it into the car. Tomorrow it gets a full test. For now, some photos of the finished bike! I could not resist the picket fence at this house across from Bob's shop for some photos. Mafac "Racer" brakes work very well -- good stopping power, and plenty of clearance with fenders and 700x30mm tires. Nice Swiss-stop brake pads. Custom, handmade front rack, and decaleur. The decaleur latches the Gout Watanabe front bag onto the bike. It releases with a simple pull with one finger on the right-side ring. Supernova rear light ... and internal cable routing! 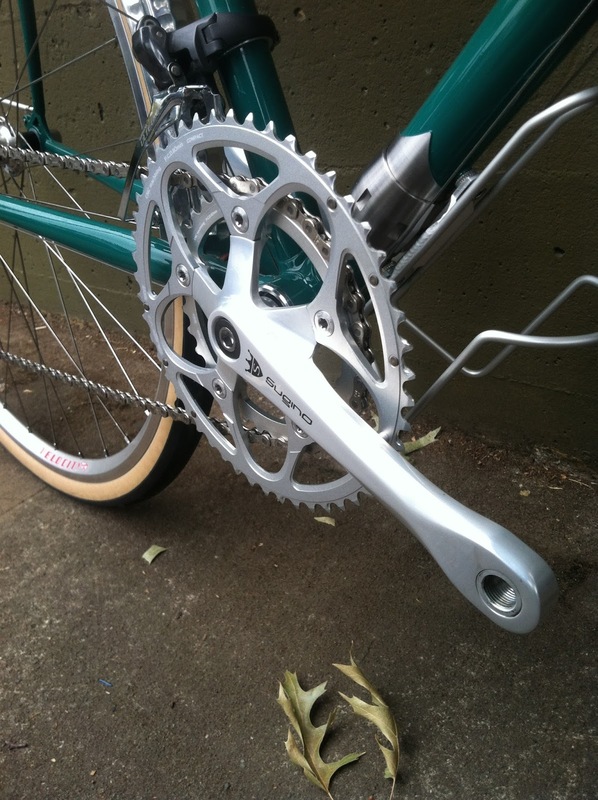 Sugino crankset, avoids the need for an (ugly) Shimano crank to go with the rest of the groupset. Chris King headset -- made in Oregon, actually made in Portland. The cockpit. Nice map cover, plenty of room for hands around the edge of the bag. Nitto "grand raundoneur" [sp] handlebars. I think with this set up I will spend more time in the drops and out on the brifter hoods, and less on the tops of the bars. But plenty of opportunity to move hands around in different positions to avoid numbness/nerve injury on long rides. Grand Bois tires -- a favorite with randonneurs.